The troubled shopfront of 117 Swan Street Richmond saw five cafes, restaurants and eateries pass through its doors in 2012 and 2013. The space is a large corner block, in a prime location and yet as each business came to its demise, one after the other, baffled locals were anxious to see something stick. It took hipster friendly Feast of Merit to seal the deal and since it opened it’s doors, streams have rolled in to sample the communal feasting. The name comes from the village of Nagaland in India. Naga people celebrate a traditional communal kind of lifestyle; sharing their wealth when coming into inheritance with everyone else in the village, to feed and share regardless of others wealth or caste. The cafe is an initiative by YGAP – Y Generation Against Poverty – a charity supporting youth education across many southeast, central Asian and African communities. The café is a fundraiser for the charity in it’s own right, where suppliers donate produce for the kitchen and many of the paid staff volunteer for the organisation outside of the café. Chef Ravi Rresser pulls together a range of vegetarian, vegan, raw, meat friendly meals with the main emphasis on communal dining. There is a clear presence of pulses, salads, and seeds on the menu that serves breakfast, lunch and a sizeable dinner. The dinner menu has a great range of local wines and craft brews to choose from that match well with most of the dishes. The breakfast and lunch menus are diverse and innovative using loads of local foraging produce, seeds and health food, boosting the ethical merit in every bite. 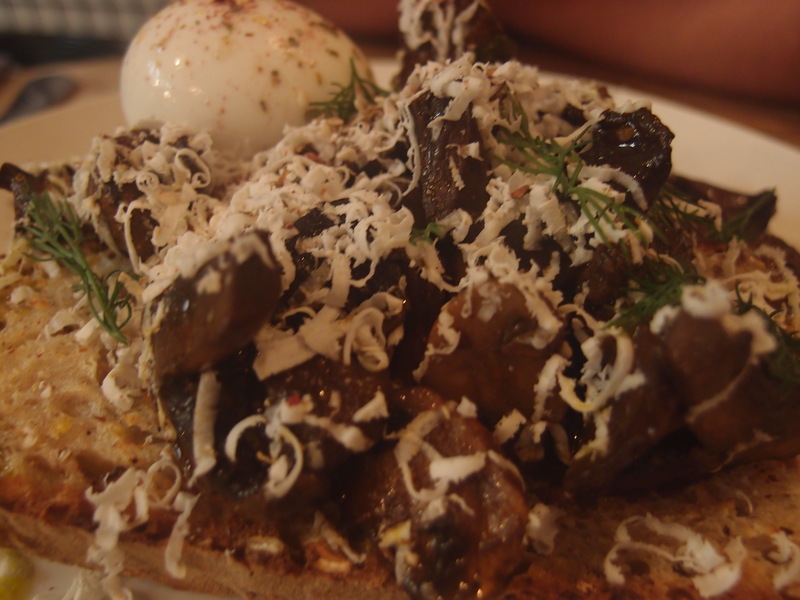 The new season mushrooms served on grain toast with chemoula, salted ricotta and a poached egg is light, fresh and full of garden flavour. The mushrooms are cooked lightly allowing for a robust and silky texture against the crispy bread and soft ricotta with every mouthful. 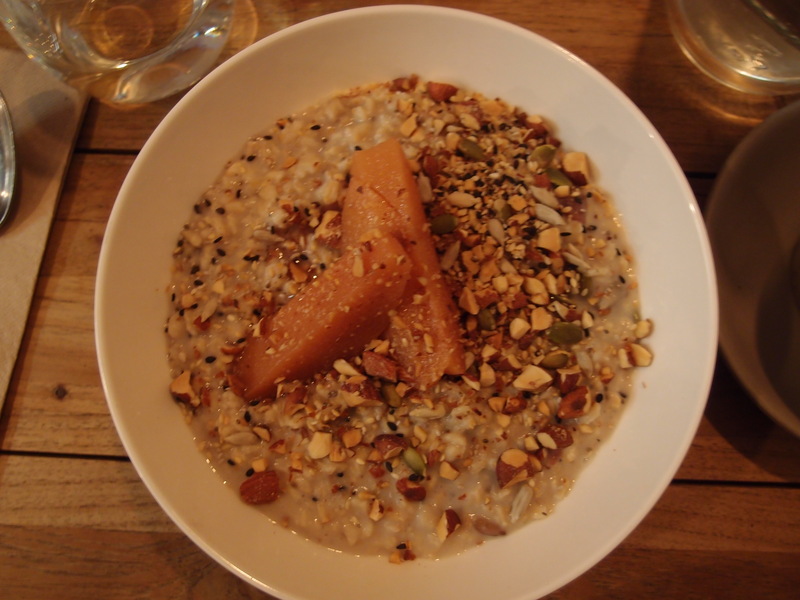 The almond milk porridge loaded with super seeds and drizzled with honey quince compote and toasted almond is a burst of sweet, dense warmth, heavy and full of creamy nutty crunch. The space has an industrial-incomplete-hipster finish with exposed brick walls, distressed wood, concrete and bare electricals that is increasingly popular in café design. With an emphasis on ethical and sustainable social responsibility those looking for a selfless, socially conscious meal will feel guilt free after their feast.